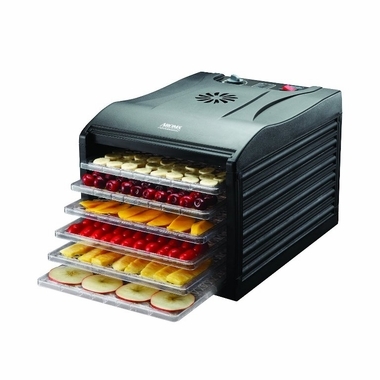 The Aroma Professional 6 Tray BPA-Free Food Dehydrator on Sale Now! Enjoy all your homemade dried favorites with the Aroma Professional Food Dehydrator. Perfect for everyone from outdoor hobbyists to the health-conscious, this BPA-free food dehydrator is designed for efficient, even drying. Fruit leather. Trail Mix. Custom potpourri. Dried Herbs and Spices. Prepare all this and more with the flip of a switch! This Aroma Food Fehydrator handles everything from fruit slices to beef jerky on six spacious, height adjustable trays. The automatic fan promotes even drying and prevents the overheating that eliminates food's vital nutrients while the adjustable thermostat ensures that all foods are dehydrated at their optimal temperature. This Aroma Professional Food Dehydrator Features 6 Removable Clear Drying Trays, Mesh Sheet to Hold Small Fruit, Clear Front View Panel, BPA-Free, Adjustable Thermostat and Temperature Control. Aroma food dehydrators are great! The aroma dehydrator is the first one that I have owned so to compare it to others I cannot. I will say, that I really like it and it does a great job. The only issue I have is not able to find mesh netting to use for smaller items such as peas. I went to the site to order some and nothing was available like what I needed. I've used many dehydrators over the years and hands down this Aroma dehydrator works the best. The unit offers large rectangular trays to allow many foods and dries very quickly. The fan is located on the back wall allowing air flow to move efficiently. The main reason I purchased it was because the unit offers a smaler footprint on my countertop thus taking up less space than other dehydrators. I'm so happy, it's an excellent BPA free food dehydrator. Great bang for the buck- I'm very pleased. Over 14 years selling healthy appliances online! Best price guarantee. We will not be undersold! © 2002-2019 HARVESTESSENTIALS.COM. ALL RIGHTS RESERVED.